Our support of Milapfest’s Indian Music and Dance programme continued from SAMYO in February and the monthly concerts into the 2015 INDIKA Music and Dance festival. Asys Events headed up the Production side working primarily with Milapfest’s Programme Manager. The Indika festival occurs alongside Milapfest Music and Dance Summer School. A wide variety of concerts are performed each evening to the music and dance school participants and the attending public. 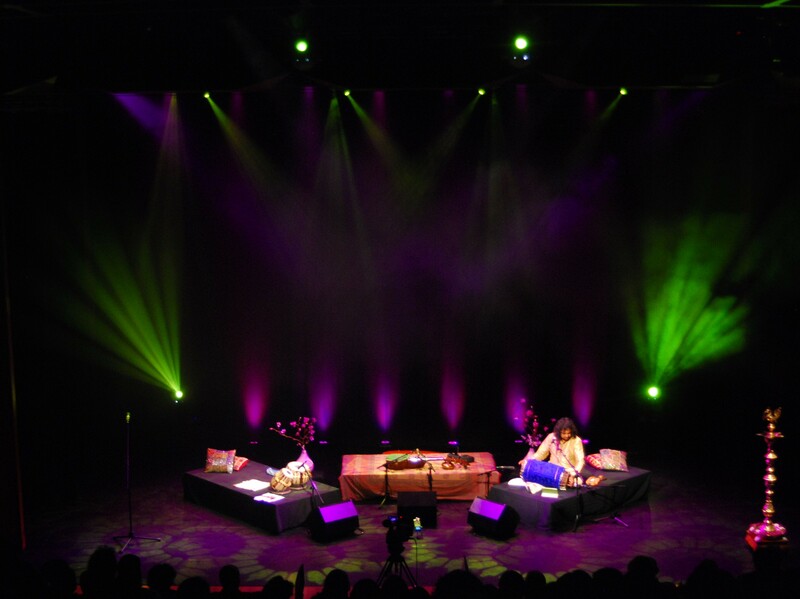 Concerts vary from Indian classical music including works from some of the top Indian musicians around, to the SAMYO youth orchestra and contemporary classical dance. Asys Events also aided in the equipment required for the summer schools including classroom PA support. Such a wide program needs a complex setup both from a lighting and audio perspective. The lighting rig was a comprehensive one consisting of Martin Mac 250 Kryptons and a number of other moving profile fixtures alongside Mac250 Washes and Mac TW1s. The generic rig was high in profile count as well as requiring the softer fresnel approach for the purpose of washes and back lighting. Performances encorporating just music utilised vibrant colour washing and beam effects. Dance performances were programmed for each evening performance on extremely short timescales. The audio setup had to cater for the largest setup of the run which was the SAMYO orchestra. As per the Southbank concert, this was large squeezing into 48 channels. The microphone list ranged from a large collection of SM57s and SM58s, to using DPA4099s on violins and sitars. For instruments such as Sarod’s and Santoors we experimented with Line Audio CM3s to great results. The small size made them perfect for an unobtrusive mic’ing solution and the flat response gave a great sound across the string range. During dance performances, the audibility of footwork and bells is key and as such we employed Crown PCC160 boundary microphones to pick this up. Other choices have been to use SM91s or similar however we found that the PCC160 was the better sounding. The addition of choir performances was also a challenge however after a few trials 4 AKG C414s in front of the choir were used. The event was a huge success and from a technical point of view, Milapfest were very pleased with the work carried out. For more information on future Milapfest events, please visit www.milapfest.com.